“Bruno,” the former Anaheim police dog who made headlines after being shot during a search with SWAT officers in 2014, died Wednesday morning, officials announced. Officer R.J. Young and Bruno are shown in a photo posted to Facebook by Friends of the Anaheim Police K9 Association. 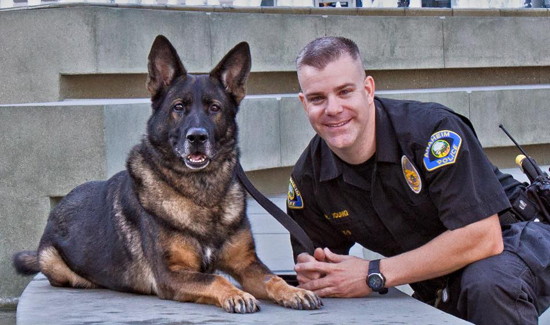 Bruno died just before 6 a.m. with his former partner R.J. Young at his side, the Friends of the Anaheim Police K9 Association stated in a Facebook post. “RJ and Bruno shared a bond few will know and our prayers are with the entire Young family today,” the post read. The public came to know Bruno when he was shot by a gunman he found hiding near a trashcan on March 20, 2014. Bruno’s jaw and left lung were damaged and a bullet lodged close to his heart as a result of the shooting. After six weeks and several surgeries Bruno was finally allowed to go home and finish his recovery with Officer Young. The man who shot Bruno also opened fire on officers before being shot and killed. “Bruno was a warrior to the end and we will never forget OUR HERO!” the Friends of the Anaheim Police K9 Association wrote.